Mike Leigh’s 1970s drama is one of those pieces everyone just seems to know. I was only six when it was first screened in 1977, far too young to have seen it then, and yet it feels like something I have grown up with, ever-present, with Alison Steadman’s Beverly the towering icon at its heart. For those few the play has eluded, or whose memories need a jog, Abigail’s Party is a dark comedy, an agonising depiction of social embarrassment. When painfully polite divorcee, Sue (Rose Keegan), needs somewhere to spend the evening while her wayward daughter, Abigail, has the titular party, Beverly (Jodie Prenger) seizes the opportunity to play host, inviting gauche new neighbours, Angela (Vicky Binns) and Tony (Calum Callaghan), to make up the numbers. Beverly’s overworked estate agent husband, Laurence (Daniel Casey), is reluctant – he has business calls to make and has to be up early in the morning – but Beverly prevails. It’s clear that Beverly always prevails. And nothing will stand in the way of her desire to show off her cocktail cabinet and leather three-piece-suite. It’s a sturdy piece of work, and one that stands the test of time, with far more to offer than the kitsch 70s-pastiche set and costumes might suggest. But these are just a kind of shorthand, a means of settling the audience comfortably into a recognisable time and place, before discomfiting us with the hubris and frailty of the characters on stage. The acid nature of the couples’ relationships and their collective lack of self-awareness drive the humour here; we, like Sue, are baffled outsiders, blinking at the awfulness of the people before us. Rose Keegan is adroit at conveying a sense of mounting horror, her pleasant manners becoming an ever-less effective method of keeping Beverly at bay. Prenger, as Beverly, is of course the key to the whole play, and she’s a formidable performer, who has the chops for the part. I can’t help wishing there was less of Steadman here though; director Sarah Esdaile asserts that “Alison is inextricably linked with Beverly’s voice” – she helped create the role – and I know that’s true, but I would prefer to see a different incarnation of Beverly, a new interpretation of this monstrous creature. After all, there are Beverlys everywhere. Vicky Binns does a cracking turn as the gawky Angela, gamely weathering her taciturn husband’s scorn, and desperate to impress. The saddest moment in the play for me is when she decries her parents’ dreadful marriage, seemingly unaware that her own is a carbon copy; the funniest is her dance. At first, I find her style a bit declamatory but, as the drama progresses, it works: Angela is performing for Beverly. Calum Callaghan might not have showy stuff to do as Tony, but his dark mood effectively puts a dampener on the evening, quelling every moment of light-heartedness or potential joy. And Daniel Casey’s Laurence is a fascinating study, almost likeable, but for his desperate snobbishness, and his vengeful urge to humiliate his wife. An excoriating social satire, Abigail’s Party might press the nostalgia buttons, but it’s still very relevant today. As somebody who lived and worked in Manchester for many years, the title of this film strikes a resonant chord with me. It refers to a particularly horrible massacre which occurred in the summer of 1819, when a huge crowd of peaceful pro-democracy campaigners marched to St Peter’s Field to hear a speech by acclaimed orator Henry Hunt, and were promptly set upon by the local yeomanry and a detachment of Hussars with sabres drawn. In the ensuing melee, 15 people were killed and more than 500 were seriously injured. The event was subsequently airbrushed from the pages of history and rarely spoken of. It’s not taught (much) in schools and many people – even those who live in the city where it occurred – have never heard of it. One man who clearly thinks of this as a major injustice is Mike Leigh. Peterloo is his attempt to rectify the situation and it represents his most ambitious undertaking to date, portraying the slow build-up to the event and the massacre itself, whilst still employing his unique (at least in film) improvisational technique, where the actors inhabit their characters and devise their own dialogue. I’m sorry to say that I don’t think it works too well when applied to something of such immense scale. Sure, Leigh has visited the pages of history before, both in Topsy Turvey and in Mr Turner but, in both cases, he was working on a smaller canvas. Don’t get me wrong, I’m generally a huge fan of Leigh’s films, but what works brilliantly when applied to more intimate events founders somewhat here. Mind you, to be fair, the film does start well. We meet Joseph (David Moorst), a young bugler at the Battle of Waterloo, clearly deeply and permanently traumatised by his experiences. The war over, he heads home on foot, to find his family struggling to survive in a country assailed by the corn laws, which prohibit the import of cheap grain. Family matriarch, Nellie (Maxine Peake), and her husband, weaver Joshua (Pierce Quigley), can barely afford to eat, so it’s hardly surprising when they find themselves increasingly drawn into the pro-democracy movement and looking forward to the great day at St Peter’s Field, when thousands of people in similar situations will come together to challenge the powers-that-be. The settings are convincingly done. Here is real squalor, real hardship, a million miles away from the chocolate box imagery so beloved of many period dramas – and early scenes of luckless individuals in court being sentenced to heinous punishments are powerful stuff. But there are a lot of characters to take in – so many that, inevitably, acclaimed actors are demoted to tiny, walk-on roles. And there are speeches – a lot of speeches – so many that the film’s two hour running time starts to drag, especially in the long sequence depicting the mass gathering at St Peter’s Field. Henry Hunt (Rory Kinnear), heralded as a hero by the protesters, is depicted as a rather unpleasant, horribly self-serving prig who clearly thinks himself a cut above the working-class people whose plight he is supposed to be representing. The people would clearly have been better served by speaking for themselves. If there’s a problem, it’s that virtually every establishment character we encounter is a smirking, pompous and downright unpleasant individual verging on caricature. This reaches its apotheosis in Tim McInnery’s turn as the Prince Regent, a bloated, giggling buffoon, not so much out of touch with the electorate as living on another planet. Of course the ruling classes’ behaviour was abominable, but this seems crude and over-simplistic. And then of course, there’s the massacre itself, a lengthy sequence that really ought to bring us to tears of outrage – but the film’s 12A rating obliges Leigh to hold back from making it too visceral and the result, with sabres clearly hitting little more than fresh air just feels clumsy and unfocused. If ever a sequence cried out to be properly storyboarded, this is it. This isn’t a total dud. Indeed, there’s plenty here that does work but, I think, too much that really doesn’t. I feel bad for not having enjoyed it more. I really wanted to like it, but ultimately, it feels like a missed opportunity. This is such an important subject, one that symbolises a turning point in British history and the democratic movement. I can’t help feeling that it deserves a better film than this. Mr Turner is that rarest of things, a resounding art house success. 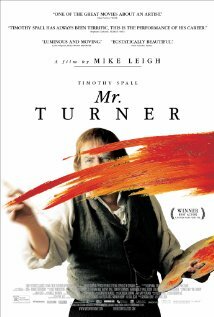 Judging by the ‘bums on seats ratio’ at my local Cineworld, Mike Leigh has succeeded beyond all reasonable expectation with this biopic of the great artist, Joseph Mallard Turner. It’s a difficult movie, one that obeys few of the rules you’d expect to find in a recent cinematic success – there are no car chases, superheroes or heads exploding in slow motion. But it’s also a richly rewarding experience and one that takes its own sweet time to convey its central message – that great artists exist outside of everyday conventions. For the first time since Topsy Turvy (his impressive biopic of Gilbert and Sullivan), Leigh has eschewed the contemporary ‘talking heads’ routine that is his trademark, to give us a historical piece where he’s employed the canny use of CGI to convey the intrinsic moods of some of the artist’s best-known work. In the title role, Timothy Spall is simply quite extraordinary. He gives us a grunting, gurning turnip of a hero, a (probably autistic) painter who is hopeless at small talk and who treats the other people who drift into his world as little more than contemptible. We witness his deplorable relationship with Hannah Danby (Dorothy Atkinson), the niece of the woman who bore him two (unacknowledged) children but, nevertheless, a subject of brutal sexuality. We see his idolisation of his father, William (Paul Jesson) and his secretive relationship with Margate landlady Mrs Booth (Marion Bailey), where he finally found true happiness. Mike Leigh is, quite simply, an anomaly. In an age where cinema is increasingly ruled by those who seek to champion the everyday, he is, quite simply, a national treasure, a man who ploughs his own furrow and does so on his own terms. Mr Turner will either leave you cold or cut you to the marrow. I’m happy to say that I belong to the latter category.